Birgitta Katarina Janson, known as Betty, was a very popular author of inspirational Christian stories and poems which were widely read from the end of the nineteenth century and into the early twentieth century. Betty Janson grew up among nine siblings in the poorly populated Dalsland. She was the daughter of Brita Maria Gullicksdotter and Hans Janson. Her father was a farm owner and highly respected parliamentary member for the peasants. He was known for his frugality and his distrust of higher bureaucracy, but also for his liberal standpoints regarding female inheritance, criminal justice and correctional treatment. During the religious debates of the period he supported the state church and distanced himself from the free church, revivalists and colporteurs in the religious disputes of the day. This was the environment in which Betty Janson began to develop her interest in writing. She never gained formal training but was educated in the traditional pastimes of the peasant household. In 1868 Betty Janson moved to Åmål where, thanks to a broadminded pastor, she had been offered a position as a handicrafts teacher at the local school. In 1870 she became drawn into the ongoing free church revival and she found her way to fellow revivalists and Åmål’s missionary association. She also started a Sunday school there. This was poorly received by the town school council and led to her being dismissed from her job as handicrafts teacher in 1878. The official grounds given for her dismissal were that her Sunday school teaching clashed with the timing of the state church service. Her dismissal was noted in the local press which publicised the school council’s announcement in full. Nevertheless, Betty Janson carried on with the Sunday school in the missionary association and even became its governor from 1891 to 1901. 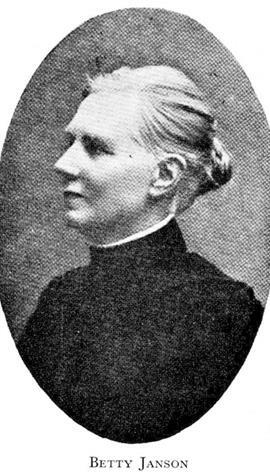 In 1892 she also became the chair of Åmål Christian women’s association. She managed to earn her keep after being dismissed from the state school in 1878 by offering private tuition in handicrafts and by producing her own textile handicrafts. After her dismissal Betty Janson also began to write, mainly prose but also lyrical poetry. In 1884 she published her first novel, Hemmets solsken. Interiörer ur svenska familjelifvet, through a small Christian publishing company, using the name “Betty”. Her debut book is a conversion novel rooted in the tradition of pedagogy by example, a literary form which with increasing complexity is also applied in her later books. Her literary output comprises nearly 40 titles, a large number of which were published in several editions right up until the 1940s. Novels such as Rök-Lenas stuga, 1899, Skuggorna vika, sol går upp, 1901, Dyrköpt lycka, 1903, and Varför, 1913, were released in five editions. Further to the stories of book length Betty Janson also wrote many short stories for Christian newspapers and journals. Many of them were collated into books, and these too were released in several editions, such as Guldgrufvan, 1900, När lyckan kom, 1908 and Skogsidyller, 1917. Her subtitles were aimed at the younger reader. In addition she also composed poems, both occasional poetry for oral delivery in the missionary association and poems collected in book form such as I solnedgången, 1906, and Helgmålstoner, 1914. Betty Janson was just one of the female authors of pious stories in her day. These stories comprise a type of literature for everyday use which aims at contemplation and edification rather than entertainment or aesthetic experience. It has always been fairly poorly regarded by the literary establishment, but for that same reason was open to female writers who would otherwise have been prevented from accessing the male-dominated public sphere and were often forced to use male pseudonyms in order to get published. The everyday use nature of pious stories also provided the space for discussion and the expression of points of view in pressing issues, as well as in professing Christianity. It to some degree competed with the strictly male priesthood. The fact that women dominated in the genre did not prove a hindrance to its success. In any case, Betty Janson’s pious stories were a hit with the general public and could be found in many homes, even beyond those of the revivalists. In general, pious stories came to comprise a respected form of light entertainment for a long time, particularly among those who distrusted fiction, which they viewed as coloured by lies and immorality. Betty Janson never used the term “novel” for her books preferring to use genre descriptors such as “life stories” or “original Swedish stories”. Her tales are also typical of the genre. Their religious, moral and existential themes were conveyed through conflictual, melodramatic and often suspenseful intrigues borrowed from popular novels, but also using complicated and thoughtful women as the central characters. Thus, for example, novels such as Dyrköpt lycka and Varför are based on the theme of “love against the odds” which is played out within the perimeters of a conversion novel. The role of marriage as a woman’s only way to realise herself is questioned, albeit it was taken for granted in Betty Janson’s time. Many of the stories also criticise the modern industrial society for its limitless individualism, egocentrism, craving for profit and lack of charity. Greed and egoism are also portrayed as timeless human phenomena, with particular harshness in the novel En gammal adelsgård, 1908, which also includes the tried and tested theme of buried treasure. Here, as in all her writings, wastefulness, indolence, lust, vanity and craving of pleasure are berated, while frugality, diligence, simplicity and chastity are held up not only as ideals but as duties. As a Christian author Betty Janson often used hidden bible quotations which are revealed in the stories. The quotation, in turn, summarises various points in the text, all in the aim of arousing contemplation. She also created highly visible and active narrators, who were in direct communication with the reader, pointing out, analysing and explaining events and giving advice to the lost characters. Christian redemption theory permeates the spiritual world of the stories, often with heavy doses of “blodsmystik” (blood mystery). However, the pedagogical and didactic tendencies were woven into complex situational problems that did not have simple solutions, and where not even the Christian faith was an obvious element. Betty Janson’s comprehensive and lengthy authorship was widespread and led to an extensive network of contacts and many journeys across the country in her older years. She attained the age of 90 before she passed away at her home in Alphyddan in Åmål in 1927. She remained unmarried and childless. Birgitta (Betty) Katarina Janson, www.skbl.se/sv/artikel/BettyJanson, Svenskt kvinnobiografiskt lexikon (article by Beata Agrell), retrieved 2019-04-22.